The story of Wythenshawe, one of the first grandly designed Garden Cities in the UK, is the story of the three ancient townships of Northenden, Baguley and Northen Etchells. Northenden in the north of Wythenshawe and Baguley in the west are mentioned in the Domesday Book of 1086. 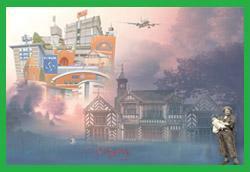 Today, Wythenshawe is the proud home of Manchester International Airport and South Manchester University Hospital. Over 52,000 people work in Wythenshawe at the Airport, Hospital and in large-scale business parks with household names like Virgin Media, PZ Cussons, Shell and Microsoft. There are over 100 community groups and clubs and over 70,000 people live here, whose children benefit from being educated in brand new state-of-the-art Academies, High Schools and Colleges.